Thanks to a recently revealed PlayStation 4 Red Dead Redemption bundle, we've got a few more details on how the Red Dead Online feature will work in the game. The online portion of the title was revealed earlier this month, but now we know a little more about what we can expect - including player support. On the back of the box, it is notated that the Red Dead Online feature hosts anywhere between 2-32 players at a time. 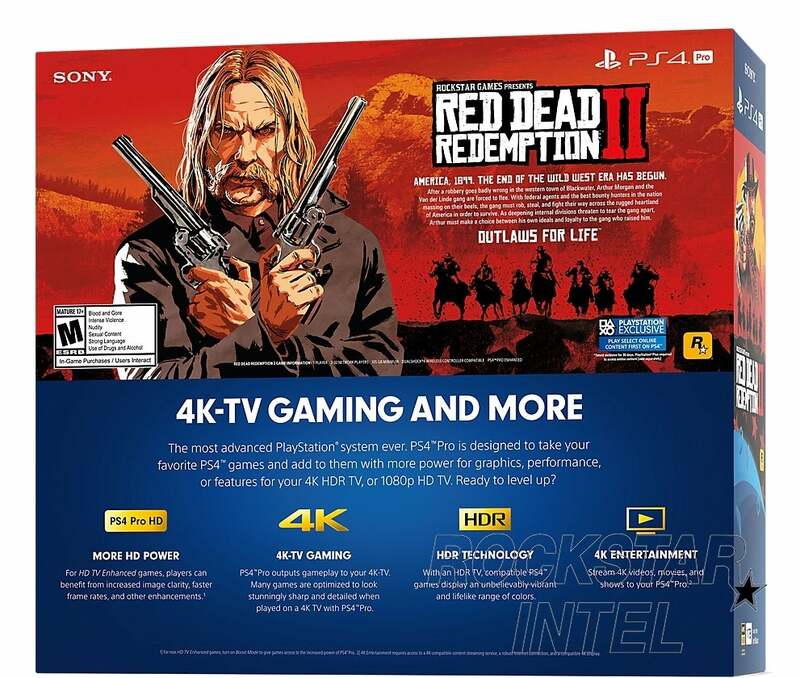 Rockstar Games themselves hasn't revealed this particular detail, but this is their official packaging. According to Rockstar earlier this month, "Red Dead Online is an evolution of the classic multiplayer experience in the original Red Dead Redemption, blending narrative with competitive and cooperative gameplay in fun new ways. Using the gameplay of the upcoming Red Dead Redemption 2 as a foundation, Red Dead Online will be ready to be explored alone or with friends, and will also feature constant updates and adjustments to grow and evolve this experience for all players." The Online service will be hitting post-launch as it continues to evolve through the beta. The team added, "Red Dead Online is planned for launch in November 2018, initially as a public beta, with more news to come soon. As with most online experiences of this size and scale, there will inevitably be some turbulence at launch. We look forward to working with our amazing and dedicated community to share ideas, help us fix teething problems and work with us to develop Red Dead Online into something really fun and innovative." For anyone that has Red Dead Redemption 2 for either Xbox One or PlayStation 4 (sadly, still no PC), the service will be completely free. As for the game itself, Red Dead Redemption 2 drops for Xbox One and PlayStation 4 players on October 26th to kick off the holiday season. "America, 1899. The end of the wild west era has begun as lawmen hunt down the last remaining outlaw gangs. Those who will not surrender or succumb are killed. After a robbery goes badly wrong in the western town of Blackwater, Arthur Morgan and the Van der Linde gang are forced to flee. With federal agents and the best bounty hunters in the nation massing on their heels, the gang must rob, steal and fight their way across the rugged heartland of America in order to survive. As deepening internal divisions threaten to tear the gang apart, Arthur must make a choice between his own ideals and loyalty to the gang who raised him."